Yes, I want to know how to play WRONG. One cannot be told to "relax" and simply do it. To understand what it is to be relaxed, one learns to tense this way and that way, and begins to understand the difference between tensing on purpose and general tension in daily life. 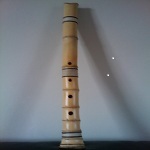 So to help my understanding of the shakuhachi, I would like to know about every bad habit anyone can think of. I want to try them all so I can understand them better and avoid them in the future. Move your elbows out from your body. Crane your neck, pointing your chin away from your body. If a note sounds wrong, halt your breathing. Take another breath and try again. While blowing a note, move the flute around to help get a clearer note. While blowing a note, move your jaw to get a clearer note. Keep your bottom lip close to the blowing edge. I would appreciate thoughts on these, and any other ideas. What bad habits did/do you have, which you needed/need to improve upon?